The scanning transmission electron microscope was developed in the 1950s. Instead of light, the transmission electron microscope uses a focused beam of electrons, which it sends through a sample in order to form an image. The advantage of the transmission electron microscope over an optical microscope is its ability to produce much greater magnification and show details that optical microscopes cannot. Transmission electron microscopes work similarly to optical microscopes but instead of light, or photons, they use a beam of electrons. An electron gun is the source of the electrons and functions like a light source in an optical microscope. The negatively-charged electrons are attracted to an anode, a ring-shaped device with a positive electrical charge. A magnetic lens focuses the stream of electrons as they travel through the vacuum within the microscope. These focused electrons strike the specimen on the stage and bounce off of the specimen, creating X-rays in the process. The bounced, or scattered, electrons, as well as the X-rays, are converted into a signal that feeds an image to a television screen where the scientist views the specimen. Both the optical microscope and transmission electron microscope use thinly sliced samples. The advantage of the transmission electron microscope is that it magnifies specimens to a much higher degree than an optical microscope. 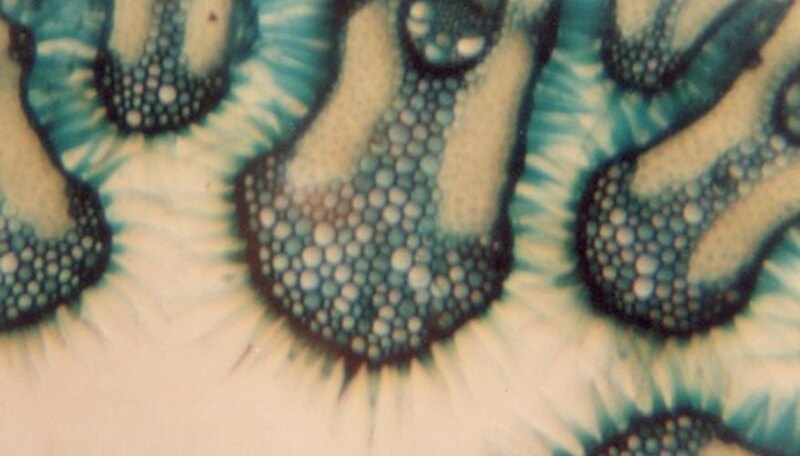 Magnification of 10,000 times or more is possible, which allows scientists to see extremely small structures. For biologists, the interior workings of cells, such as mitochondria and organelles, are clearly visible. The transmission electron microscope offers excellent resolution of the crystallographic structure of specimens, and can even show the arrangement of atoms within a sample. The transmission electron microscope requires that specimens be put inside a vacuum chamber. Because of this requirement, the microscope cannot be used to observe living specimens, such as protozoa. Some delicate samples may also be damaged by the electron beam and must first be stained or coated with a chemical to protect them. This treatment sometimes destroys the specimen, however. Regular microscopes use focused light to magnify an image but they have a built-in physical limitation of approximately 1,000x magnification. This limit was reached in the 1930s, but scientists wanted to be able to increase the magnification potential of their microscopes so they could explore the interior structure of cells and other microscopic structures. In 1931, Max Knoll and Ernst Ruska developed the first transmission electron microscope. Because of the complexity of the necessary electronic apparatus involved in the microscope, it wasn’t until the mid 1960s that the first commercially available transmission electron microscopes were available to scientists. Ernst Ruska was awarded the 1986 Nobel Prize in Physics for his work on developing the electron microscope and electron microscopy. University of Nebraska-Lincoln: What Are Electron Microscopes? Why Are Electron Microscopes Important? S., Karen. "What Are the Advantages of the Transmission Electron Microscope?" Sciencing, https://sciencing.com/advantages-transmission-electron-microscope-6309088.html. 24 April 2017.